In 2008, Bergen Neurology Consultants began searching for a comprehensive Electronic Medical Record Record. Their goals were to improve efficiency and streamline workflows, so as to provide better patient care and to create a pleasant experience for each patient visit. Bergen Neurology Consultants selected eClinicalWorks’ comprehensive EMR/PM solution for better patient care. 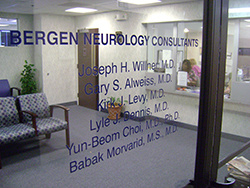 Located in Bergen County, New Jersey, Bergen Neurology Consultants was formed by five physicians who came together to provide local patients with healthcare comparable to that offered in the surrounding urban areas. Bergen Neurology physicians offer EMG, vertigo testing, carotid ultrasound, and ambulatory EEG services, along with affiliates that provide neuropsychological evaluations and physical therapy.